Stimulating bone strength through dynamic movement and weight bearing posture based on Dr. Feldenkrais approach to somatic learning. 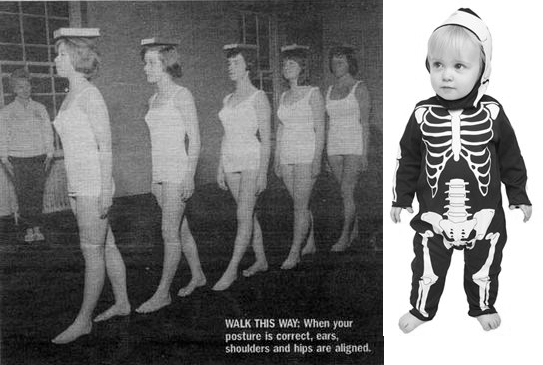 Dynamic and weight bearing movement, is the natural and efficient incentive for the rehabilitation of bone health. A powerful elastic pulsating impact of a well organized intense walk, is necessary for empowering the blood circulation to penetrate into the fine capillaries inside the solid texture of the bone, and providing it with building materials for its renewal. 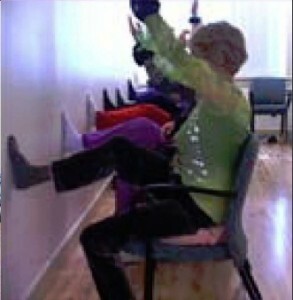 Lifting of weights, the direct stimulation for strengthening bone mass, is done in standing while leaning onto a wall, with a lower back well padded. The more the posture function efficiently the stronger the bone become. Even the weight of the body itself through daily movements, when coordinated as nature meant, works to stimulate bone strength. The improved uprightness of the posture then radiates the body language of self confidence and inspires a sense of age less, biological optimism. 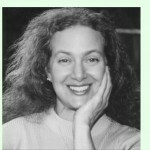 Ruthy Alon is a Senior Trainer in the Feldenkrais Method®. 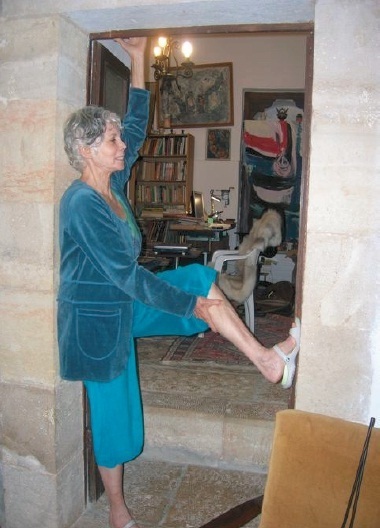 For eight years, from 1959–1967, Ruthy attended Moshe Feldenkrais’ weekly classes in Tel Aviv, where she learned the guided movement processes he later called “Awareness Through Movement”®. Those were the years that Moshe Feldenkrais was well known in Israel as the personal tutor of Prime Minister Ben-Gurion. 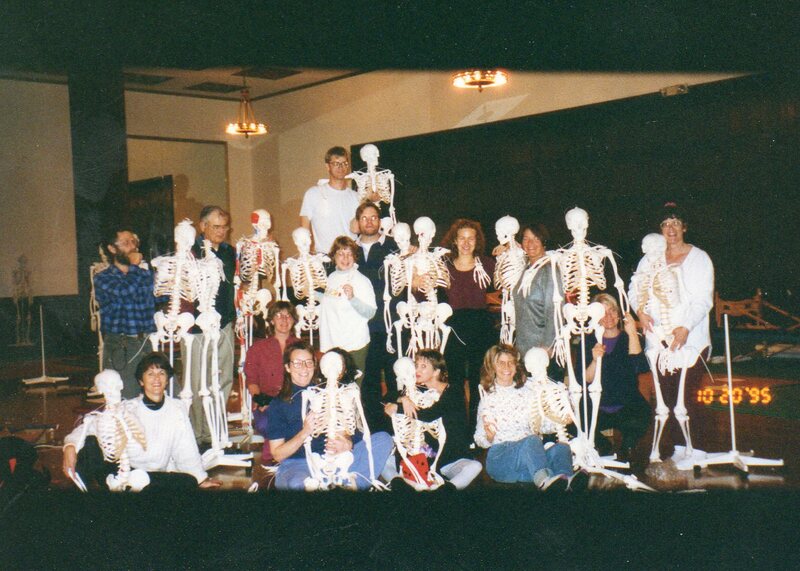 Her ongoing quest to promote and restore well being in people’s lives has led her to create her life work in the Bones For Life program for stimulating bone strength using natural movement and weight-bearing posture. In the Bones program, she applies the somatic learning principles of greenhouse conditions from the Feldenkrais Method® to the dynamic moving in the reality of vertical standing, as required for stimulating bone strength. The Bones for Life program is expanding in many countries. 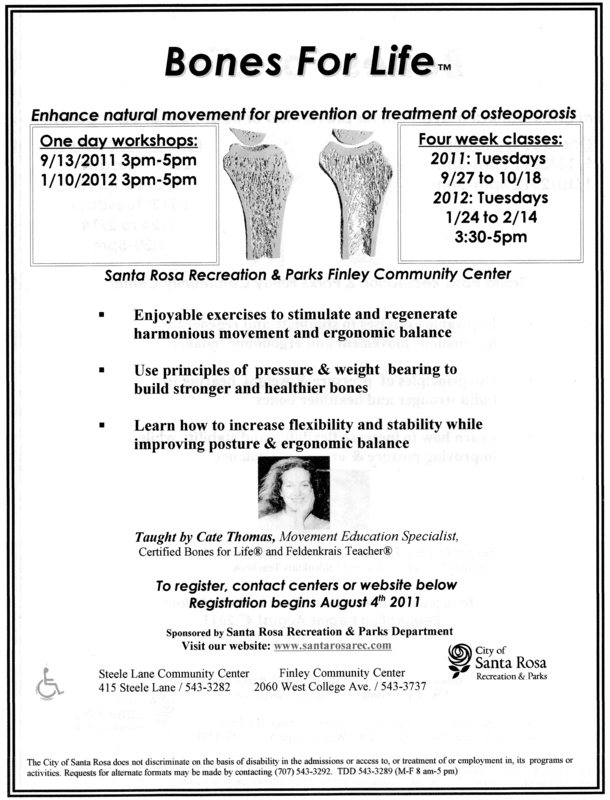 The program was recently introduced to the staff at the NASA center in Texas, where it was accepted for improving bone density for astronauts..
Cate Thomas, certified Teacher/Trainer in the Bones for Life method, worked with Ruthy for many years, and has brought another progressive dimension with faster results to the Bones for Life body of work. Her work with people of all ages who need to feel stronger, more supple and actually increase their bone density has been proven over time. (testimonials available) Her work is available in group or individual form. Please email or fill out intake at the intake section of this website. For Bones clients, please list medications taken and any other relevant information for your situation. We look forward to your progress! 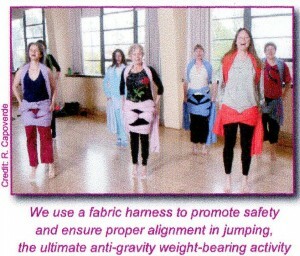 Classes offered and recommended for peoples of all ages! Email Cate to Schedule your Lessons Now!